Jianzhi (George) Zhang is a Professor of Ecology and Evolutionary Biology interested in the relative roles of chance and necessity in evolution. He got his B. S. from Fudan University in Shanghai, China, and his Ph. D. in Genetics from Pennsylvania State University. He was a Fogarty postdoctoral fellow at the National Institute of Allergy and Infectious Diseases before moving to the University of Michigan. 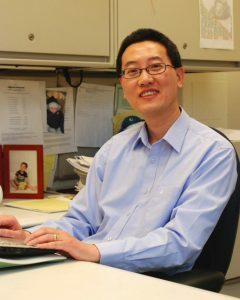 Professor Zhang’s research focuses on two main research areas: (1) yeast as an experimental system for studying evolution, where his research group uses the budding yeast Saccharomyces cerevisiae and its relatives as model organisms to understand a variety of evolutionary processes such as the genetic basis of phenotypic variations among strains and species, or molecular and genomic bases of heterosis; and (2) computational evolutionary genomics where they use evolutionary, genomic, and/or systemic approaches to analyze publicly available data to characterize and understand pleiotropy, robustness, epistasis, gene-environment interaction, gene expression noise, translational regulation, RNA editing, convergent evolution, adaptation, origin of new genes, among-protein evolutionary rate variation, and other important genetic and evolutionary phenomena. Projects may also involve modeling and simulation, including the MICDE catalyst grant project where the team is using deep neural networks to infer molecular phylogenies and extract phylogenetically useful patterns from amino acid or nucleotide sequences, which will help understand evolutionary mechanisms and build evolutionary models for a variety of analyses.